Want your Pit bull to grow big, healthy and strong? Then you need to feed them a high-protein and high-calorie dog food. Sufficient protein is necessary to build lean muscles so they continue to thrive and minimize the diseases linked to protein deficiency. Inferior quality dog foods have low protein percentages and its protein source is often derived from a plant as opposed to what should be lean meats. Since they are prone to allergies as adults, hypoallergenic dog foods are a good way for you to make sure your pitbull is getting only the best without any harmful fillers or allergy triggers. 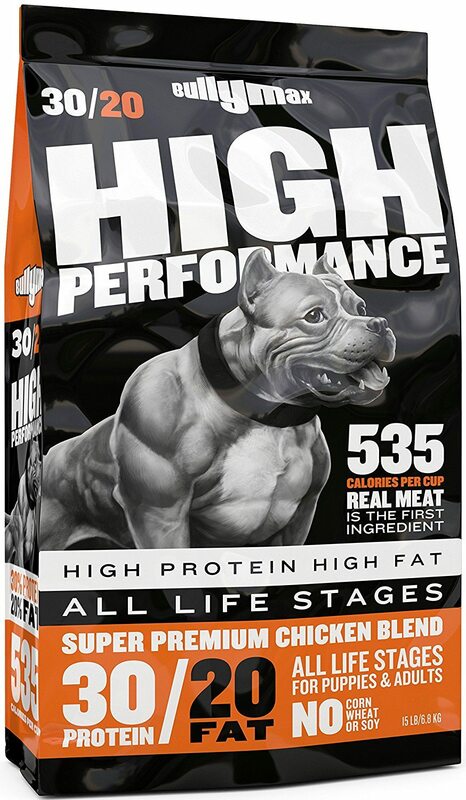 With these types of dog food brands, high-quality protein is always the first ingredient. 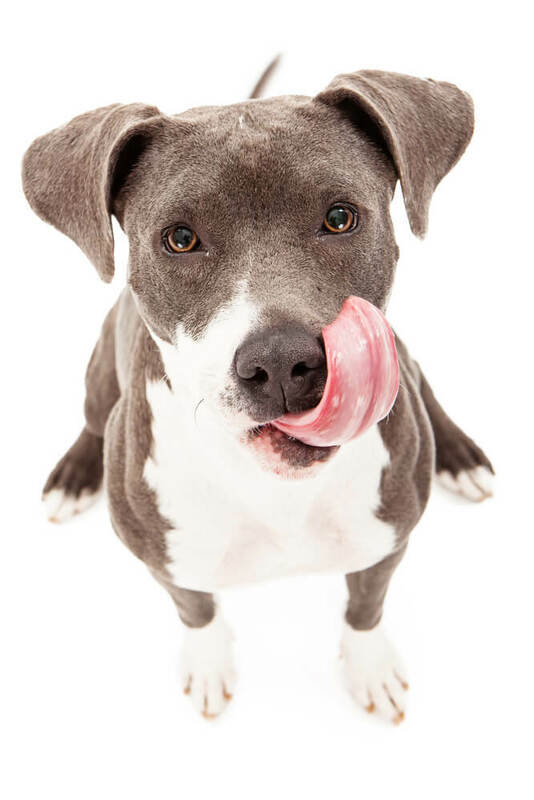 In this article we take a look at the 6 best foods for your Pitbull and the reasons why we’ve chosen them along with a complete guide to feeding your loving Pittie. What To Look For in a Pitbull's Dog Food? All dogs have specific dietary requirements that require a certain balance. That balance can easily be thrown off and affect a pitbull’s health. If any key ingredients are missing or exist in too high a quantity, it can have a negative impact on your dog. Protein is an essential ingredient in any dog food, providing amino acids to support healthy bones and muscles. 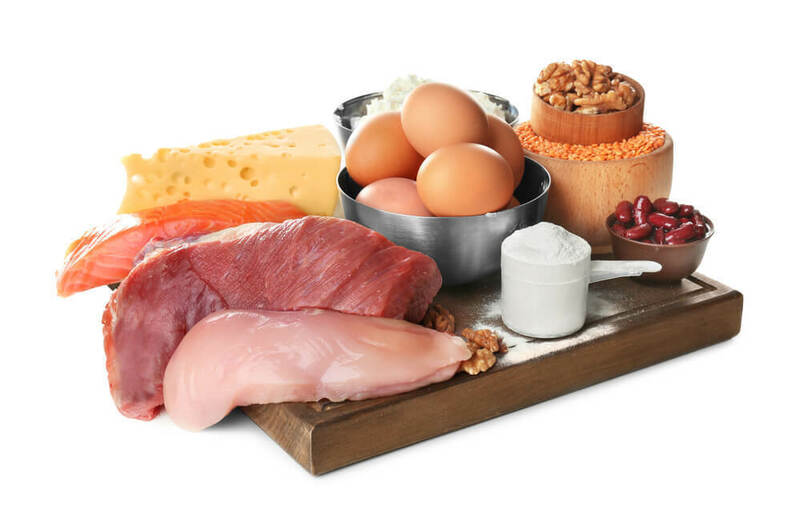 Protein serves the important functions of helping to heal damaged bones and muscle tissue along with aiding in the production of antibodies which help dogs fight off infections. Proper protein levels supply dogs the enzymes and hormones they need for their bodies to function healthily on a chemical level. Most pitbulls should be fed dog food with a crude protein content of no less than 30%. Also not all protein is equal. Look for proteins with a high biological value. These are real meat sources (chicken, fish and other poultry), other meats, meat meals. That means, no plant-based protein or meat-by products. Develop a weak immune system. Carbohydrates are another key part of every dog’s diet that helps sustain their energy for hours of fun, play, and sometimes hard work throughout the day. Carbohydrates are usually included in dog’s food in the form of thoroughly cooked grains (like rice or oatmeal), vegetables (like chickpeas), or processed starches (like potatoes and peas). Fats are another important source of energy and also serve as an important delivery system for vitamins. Fats help metabolise vitamins A, D, E and K, which are essential for complete health. Fats are also important for nervous system functioning and promoting skin and coat health. Fats as you might know is what makes dogs’ food so palatable and tasty, making sure that they maintain a healthy appetite. Crude fat in a pitbull’s dog food shouldn’t be lower than 20%. Fiber is another factor that is important in your pitbull’s diet, since it helps keep their digestive health on track. Fibre content for dogs should generally be around 5%. You should be aware that the more fiber, or the wrong types of fiber, could cause problems like flatulence, bloating, and diarrhea in dogs. Pet food companies now have vitamins and minerals in their dog food formulas down to a science. These ingredients help with body development and the maintenance of healthy bodily functioning. Some of these things include glucosamine and chondroitin for joint support, Omega 3 and 6 fatty acids for skin and coat health, or calcium and phosphorus for strong bones. Buying high quality dog food means that owners won’t need to add supplements to their pitbulls’ diet unless recommended by a vet. Pure, fresh water is the only other essential part of a dog’s diet. It goes without saying that cool water should always be available to dogs. 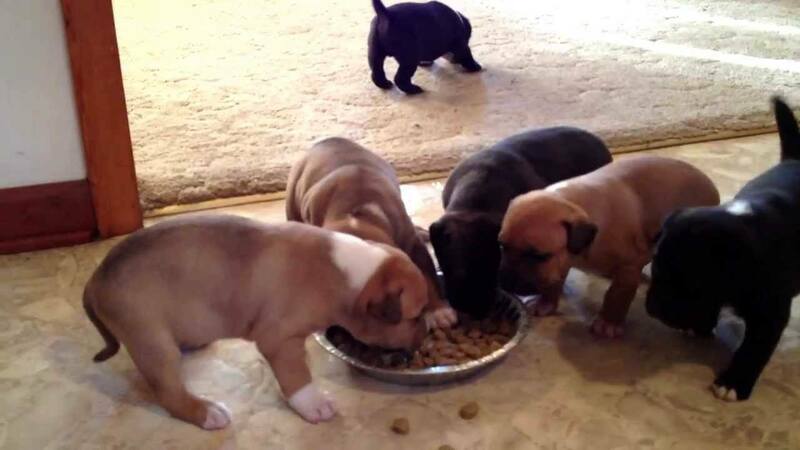 Feed pit bull puppies as much food as you can because this is an important stage of their development process. Keep their diet consistent unless a problem develops. This means using the same brand of food at the same times and measuring out the same amounts each day. Small pitbull puppies could need anywhere from ½ to 1 cup of dry dog food per day, for example, whereas a larger pitbull puppy would need anywhere from 3 to 6 cups per day. Dogs who engage in activities like dog sports and obedience training may need more nutrition than a regular family dog who gets moderate exercise. Some of the different breeds of pitbulls mature faster than others. 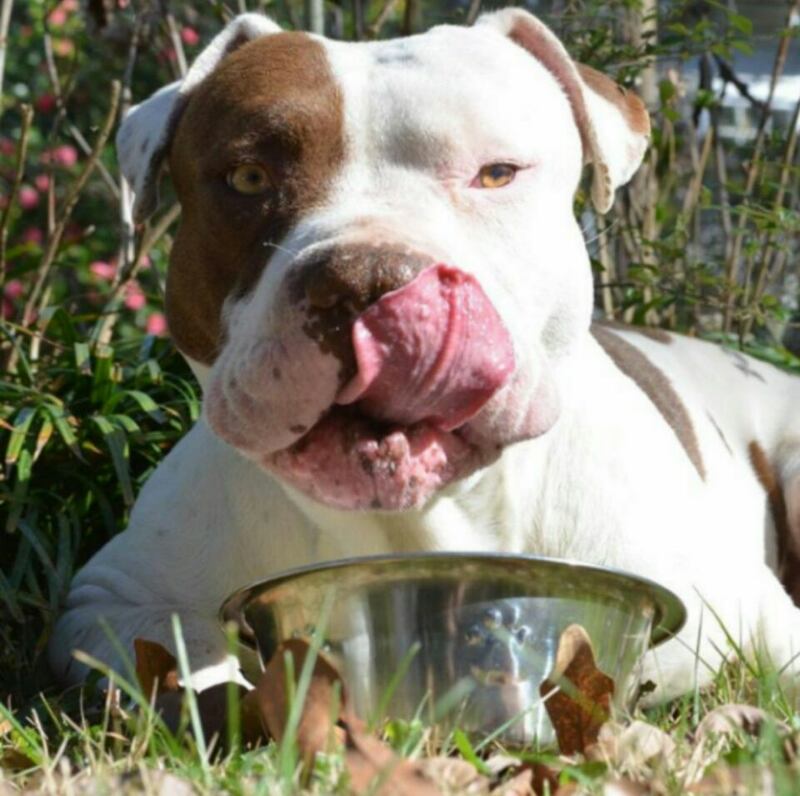 These pitbulls will need different protein and fat levels sooner, unless you buy a high-quality dog food that is approved for all life-stages. If you started feeding your pitbull a puppy formula, research your pitbull’s family breed history for a better idea of when they will reach maturity so they can be switched to adult food. One of the reasons why this is important is because feeding an adult dog puppy food can lead to excess weight gain, resulting in many health problems, like difficulty breathing, digestion problems, and joint pain. It is important to remember that dogs’ diets need to be tailored to the individual dog and what is right for them. Most adult dogs do well on two feedings per day, but you can adjust that and feed your dog one to three times per day if it makes sense. Dogs used for showing, hunting, breeding, or rigorous activity may need more nutrition than the average adult diet and be fed a little more. Like puppies, adult dogs are at their best when owners maintain consistency in their diet and feeding schedule. In terms of general caloric requirements, a small adult Pocket Pitbull could need anywhere from ½ to ¼ cup of dry dog food per day. A large adult American Bulldog could need five cups or more. Dogs are usually considered to be seniors at around 8 years of age, but some dogs are still at their prime at that age. To be sure, keep an eye out for any subtle metabolic changes and feed your pitbull per its energy level requirements. Some senior dogs may still be very healthy and have a lot of energy. Owners can adjust their dog’s diet when they see it is necessary. As dogs age, their energy will naturally start to decrease just like us humans. Owners should switch their senior dogs to a senior dog food formula when they start to notice this decline. If you continue to feed your senior dog the same kind and amount of food that they ate when they exercised more, your dog will start to put on too weight. Since obesity has many unpleasant symptoms and is one of the greatest killers, this is something owners NEED to watch out for. A small senior pitbull generally needs about ½ to 1 ½ cups of senior dog food per day and larger pitbull breeds still need more than 5 cups per day. First Five Ingredients: Deboned Chicken, Chicken Meal (Source Of Glucosamine), Peas, Pea Protein, Tapioca Starch. Blue Buffalo Wilderness is a healthy and holistic dry dog food brand that can provide pitbulls with the complete nutrition that they need to thrive. Wilderness is a 100% grain free recipe with natural ingredients that are all meant to be in a dog’s diet, unlike cheaper dog food brands available on the market. Blue Buffalo dry dog food is high in protein and uses real chicken as its main protein source. In addition to being grain free, Wilderness does not contain other controversial ingredients like meat by-product meals, corn, wheat, or soy. 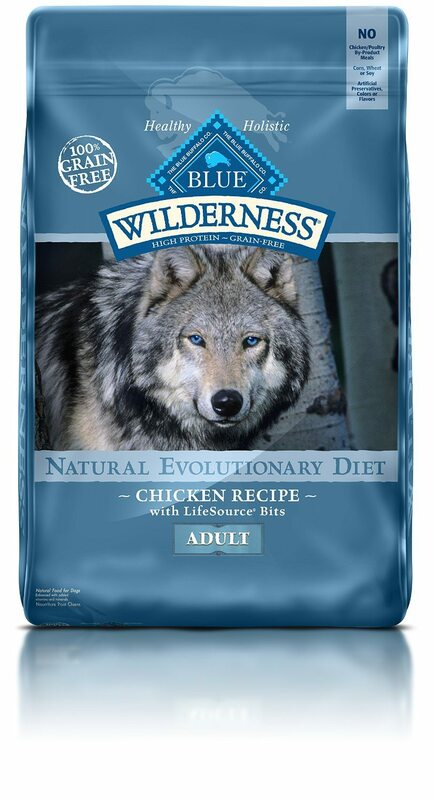 Like all Blue Buffalo dry dog foods, Wilderness contains BLUE’s exclusive LifeSource Bits: a precise blend of vitamins, minerals, and antioxidants. LifeSource Bits are included to make sure that dogs are getting everything they need to be healthy and active. This means that owners can feed their dogs Wilderness exclusively along with fresh, clean water unless otherwise instructed by a vet. Along with chicken for protein, this recipe uses sweet potatoes, peas, and potatoes as sources of important carbohydrates which are required to maintain pitbulls’ high energy levels. Blueberries, cranberries, and carrots are some of the fresh fruits and vegetables included to provide dogs with key vitamins, minerals, and antioxidants for immune support. Flaxseed is included in this recipe as one its source of healthy Omega 3 and 6 fatty acids, which help give dogs healthy skin and shiny coats. This Blue Buffalo recipe contains a minimum of 34% crude protein, 15% crude fat, and 6% maximum crude fiber and 409 kcal/cup. This is a popular high-protein option for dogs like pitbulls who get a lot of exercise and a very popular choice with other Pitbull owners. First Five Ingredients: Deboned Turkey, Turkey Meal, Chicken Meal (source of Glucosamine), Peas, Potatoes. 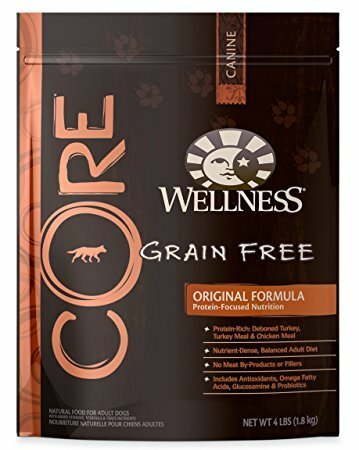 Wellness Core is a USA-made grain free dry dog food that provides dogs with protein-focused nutrition for strong bones and healthy muscle development. This recipe’s three main sources of protein are deboned turkey, turkey meal, and chicken meal. Wellness Core focuses on feeding dogs only the best ingredients without adding any harmful fillers, meat by-products, corn, wheat, soy, or artificial colors, flavors, and preservatives. For owners, who also like to feed their dogs raw food, check out their raw and freeze-dried kibble which can be mixed with regular kibble. This manufacturer designs each of their blends so that they deliver safe, high-quality nutrition through the use of quality ingredients. This dry dog food is high in nutrients to make sure that dogs are being provided with a well-balanced diet that doesn’t need to be supplemented with anything other than fresh, clean water. Wellness Core includes antioxidants to support healthy immune functioning, Omega fatty acids for skin and coat health, glucosamine for joint health, and probiotics for healthy digestion... just to give you an idea of how well they have dogs covered. Peas and potatoes make this recipe’s main carbohydrate sources, which provide dogs with the energy they need to be active and playful throughout the day. Whole, natural ingredients like carrots, kale, apples, broccoli, and spinach provide the vitamins and minerals needed to support whole body functioning and maintain things like dogs’ eyes, brain, healthy teeth and gums. This kibble contains no less than 34% crude protein, 16% crude fat, and no more than 4% crude fiber, with 421 kcal/cup. Wellness CORE Grain-Free Original Deboned Turkey, Turkey Meal & Chicken Meal Recipe is another great grain-free option for pitbulls offering high protein, reasonable fat content, and average fiber content. A five star rated dog food, Bully Max 30/20 dry dog food is especially formulated for all pit bull breeds and is suitable for ages 7 weeks or older including pregnant and nursing dogs. Created with the highest-quality human-grade ingredients we can see why owners love feeding their pit bulls this dog food formula. Given the high levels of protein, we believe this formula is best for athletic Pitties. This dog food is formulated to fuel your pup’s performance since it is high in protein and high in calories (535 kcal/cup). In addition, owners with sensitive or allergy prone pit bulls can find solace in this recipe since it contains NO corn, wheat or soy and is made from natural ingredients. That means no cheap or unhealthy ingredients found in this dog food. Their guaranteed analysis is also impressive at: 30% crude protein, 20% crude fat, 3.8% crude fiber, 3.85% in omega 6 and 0.5% in omega 3. It’s easy to see why dog owners switch from general dog foods to this specially formulated dog food brand. Since pit bulls have a muscular build, this formula helps them put on the much desired lean muscle. The first five ingredients are: chicken meal (it has 300% more protein than fresh chicken, brown rice (a source of healthy and lean complex carbs. ), chicken fat (a natural source of fat), dried plain beet pulp (a source of fiber to maintain a healthy colon and gut), and ground sorghum (a natural source of protein, energy and fiber). The formula also contains fish meal, eggs, fish oil, probiotics, Vit. E, B12, A, D and a very impressive array of minerals. It really is quite an impressive list of ingredients. I would have liked to have seen vegetables and fruit used in this formula but the added minerals and vitamins well make up for the lack of them. All in all, this 100% natural dog food is highly recommended, providing a well-balanced diet for your pit bull with more than adequate levels of protein, fat and calories. The dry dog food brands reviewed so far are great for giving pitbulls a complete diet that consists of everything that they need to be happy and healthy. However, some dogs are plagued by allergies and sensitivities. The sad thing is that owners can’t always quickly figure out what is behind their dogs’ symptoms. Often the culprit is one of the ingredients in a dog’s food, especially if their owner buys cheaper grocery store brands containing artificial additives and inexpensive fillers. Sometimes overly common protein and carbohydrates like chicken and potatoes that are the trigger. Other times, it can be ingredients like grains, corn, wheat, eggs, or dairy. By placing their dogs on a limited ingredient diet until the allergy symptoms clear up and slowly re-introducing some of these potential triggers, owners can usually figure out what is causing their dogs’ allergies. In the future, all they need to do is avoid those ingredients so their dogs’ allergy symptoms don’t resurface. First Five Ingredients: Salmon (source of Omega 3, 6 fatty acids), Ocean Fish Meal, Sweet Potatoes (source of complex carbs), Potatoes, Peas. Taste of the Wild Salmon is a good option for pitbulls with allergies because salmon is a less common source of protein in dog food that doesn't triggers skin allergies. Real smoked salmon is an excellent source of healthy fats that make this dry dog food extra palatable for picky dogs and encourages a healthy appetite. 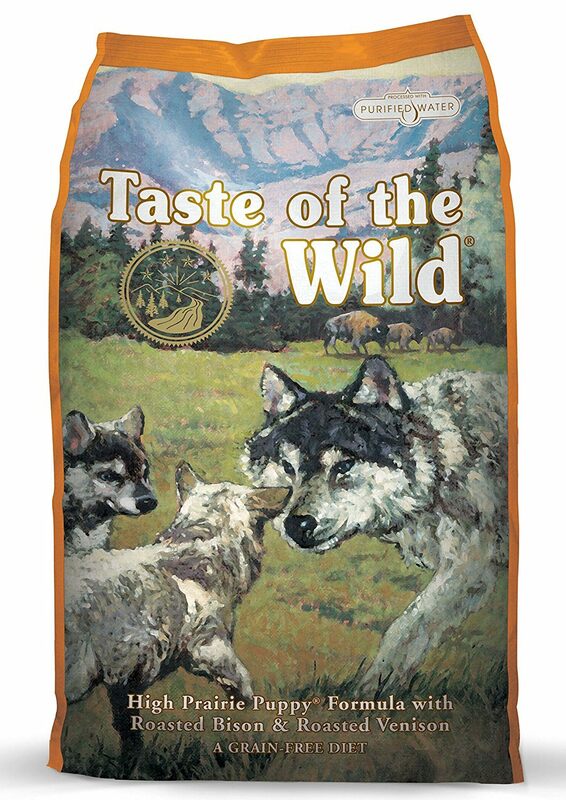 This Taste of the Wild recipe is grain-free and uses sweet potato as its source of highly digestible carbohydrates to give dogs energy. This blend offers 25% crude proteins, 15% crude fats with 360 kcal/cup. Along with high-quality protein and carbs, Taste of the Wild Salmon contains whole fruits and vegetables to provide dogs with important antioxidants, vitamins, and minerals that are needed to support a pitbull’s complete health and optimal body functioning. Some of these ingredients include blueberries, tomatoes, peas, and raspberries. Canola oil is used in this recipe as a source of healthy fatty acids to help give dogs healthy skin and shiny coats. As other Pittie dog owners can attest, this is a highly palatable kibble that your dog will love! Puppies require different nutrition than adult and senior dogs. They require more protein and nutrients to help support the growth of healthy bones, muscles, brains, and more. Puppies also need to be fed more often, up to four times per day when they are young to keep up with their energy levels and growth. The number of feedings per day is gradually reduced a puppy nears maturity, usually to one or two feedings a day in adulthood. First Five Ingredients: Deboned chicken, deboned turkey, atlantic ﬂounder, whole eggs, whole atlantic mackerel (source of Omega 3,6). Orijen Grain Free Puppy is specially formulated to meet the dietary needs of growing puppies. This recipe is made with 85% poultry, egg, and fish ingredients to help support healthy bone and muscle growth at this key stage in a dog’s development. These ingredients make up the puppy’s main sources of important proteins and fats. The other 15% of ingredients are fruits, vegetables, and botanicals needed to balance out a growing puppy’s diet and ensure complete health. Owners can confidently feed this dry dog food to their pitbull puppies because it is made in Alberta, Canada using only the freshest ingredients grown and farmed in the region. Two-thirds of the meats in this recipe are fresh or raw and they don’t use any preservatives. The other third is air dried at 90 degrees Celsius to provide dogs with a concentrated source of protein, while infusions of freeze dried meats are included for a natural flavour that puppies love. 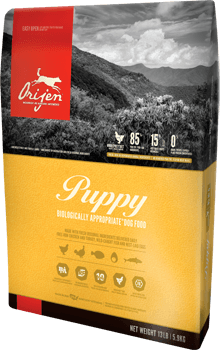 Some of the other ingredients included on Orijen’s puppy formula are lentils, peas, pumpkin, squash, kale, apples, and carrots. Calorie distribution of the 449 kcal per 8oz. cup is 39% from protein, 20% from vegetables and fruits and 41% from fat. This recipe is limited in carbohydrates, using sources that release sugar slowly so puppies still get the energy they need without leading to excess weight gain. Overall this is great choice of quality dry kibble for a growing Pitbull. First Five Ingredients: Buffalo, Lamb Meal, Sweet Potatoes, Egg Product, Pea Protein. 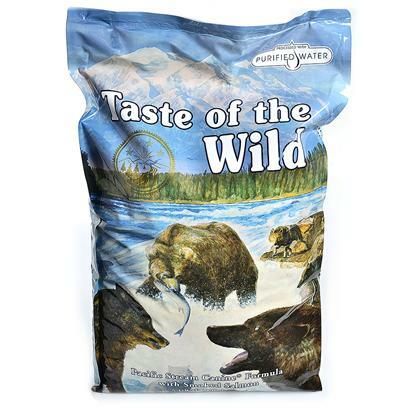 Taste of the Wild High Prairie is a grain free puppy formula made with a blend of protein sources including real roasted meat for exceptional taste. Fruits and vegetables are included to provide important antioxidants, vitamins, and minerals needed for healthy functioning. This formula meets AAFCO’s established nutritional levels for All Life Stages, providing puppies with the complete nutrition they need to grow and thrive. Some of the main ingredients in this recipe include buffalo, bison, venison, lamb meal, sweet potatoes, egg product, blueberries and raspberries. The protein sources in this dry dog food are unique and not found in most dog foods, so they are less likely to trigger allergies and sensitivities in puppies. This blend offers 28% crude proteins and 17% crude fats with 370 kcal/cup so it has slightly fewer calories than our other puppy food choice if you have a Pitbull puppy on the plump side. Flaxseed, salmon oil, and canola oil are a few sources of healthy Omega 3 and 6 fatty acids provided in this recipe to help give puppy’s healthy skin, a shiny coat, and support eye and brain health. Dried chicory root is added as a source of highly digestible fiber. A cheaper alternative to Orijen yet still a quality kibble for your growing puppy. So, What's The Best Food To Feed a Pitbull? Be ready to adapt your dog’s diet as they age through the adult and senior stages or if any unexpected allergy symptoms occur. There are many formulas available for puppy, adult, and senior dogs which provide specific nutrition needed at that life stage. Owners can also look for formulas that can be fed consistently to a dog throughout each of their life stages. 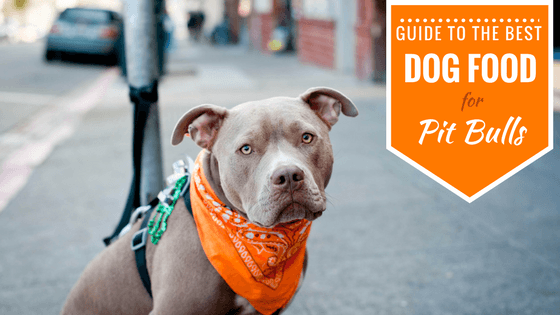 The important thing is to find foods that don't contain any harmful ingredients or fillers or look for hypoallergenic dog food formulas if your Pittie is very sensitive- since the number of ingredients used are limited to just one protein. Focus on the key ingredients that dogs need for a strong diet like high protein, high calories, healthy carbs, fats, vitamins and other key nutrients. Best of all, by feeding your pitbull a balanced and nutritious diet, you’ll find yourself with a happy and healthy four-legged friend for years to come. Also Read: Why Pit Bull Owners Need Pet Insurance?